"I am a company that was founded as Ford Motor Company in Dearborn, Michigan on June 16, 1903 by Henry Ford. I am 104 years old. I have 300,000,000 offspring called automobiles. I am a vegetarian and do not smoke or drink. I am opposed to womanizing and most gambling involving the risk of hard currency. But I thrive on gambles involving new and innovative products however. I believe in giving a man a square deal for a square days work. In 1914 I began paying my workers the then princely sum of $5.00 a day, which was double the going rate at that time. I also reduced the workday from 9 hours a day to 8 hours a day, and reduced the workweek to 40 hours. In 1914 I ran as a peace candidate for congress and traveled to Europe to try to promote peace and forestall WW1, which was then looming on the horizon. I failed in that respect. But I tried. And I was ridiculed for my efforts. In 1942 I patented and built a plastic automobile that was based on soybeans, and was 30% lighter than conventional steel cars of the time. And it also ran on ethanol. In 1938 Ford Motors had a 38% share of the US market. In 2006 it was 14%. And last year Ford lost nearly 13,000,000,000. Yes that's 13 billion dollars. Healthcare costs at Ford add over $1000.00 to the price of each automobile. In Asia the added cost ranges from zero to just a tiny, tiny fraction of that amount. Most Asians are generally vegetarian, and are not burdened by the unhealthy Western diet of meat and dairy products and heavily processed foods. Or the ailments that are endemic to this unfortunate diet. It is a compounded matter of fact that over 70% of our medical difficulties are related to diet. It is an acknowledged fact that veganism or a vegetarian diet can reduce our medical problems by nearly 70%. With that decrease comes an enormous reduction in medical costs. This reduction in healthcare would return Ford to profitability; and restore Ford to a healthy and vital American company. I urge each and everyone of you to join with me in urging that Ford cafeterias prepare only vegan or vegetarian meals. 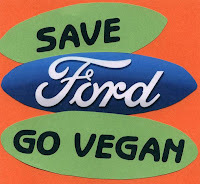 Likewise, all Ford employees and their families and loved ones should be persuaded to adopt a vegan lifestyle. This lean and vital new workforce is what is needed to successfully challenge the competition in the coming decades. Not only will Ford benefit from this arrangement but also the millions of factory farmed animals that suffer in unceasing misery and despair. And this beleaguered planet will also benefit from this scenario, since the production of methane, a byproduct of factory farming, will also be considerably diminished. And the destruction of rainforests will be slowed or halted, benefiting all the inhabitants of this planet. So stand up and be heard, like Mr. Ford himself in 1914." If only I had known that the solution was so simple, I could've fixed Ford while I was at the agency! Isn't it amazing what kind of crackpots will post their half-baked ideas up on the internet? I wonder whether the productivity would go down in the factories with the workers eating just rice, twigs and berries, thereby causing higher production costs per vehicle? 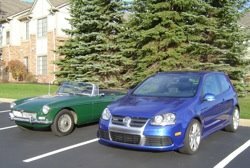 I recently read an article about Ford recycling its paint fumes into fuel cells. With their workforce eating all of the tofu and beans, perhaps such a fume reclamation system could be added to the factories for the human emissions. Or maybe - just maybe- the owner of this MySpace page should wake up and smell the bacon frying. Does (s)he really think that the average American worker is going to switch to vegetarian/vegan? Fat chance. BTW.. I've followed your blog for a couple of months now. I discovered it when trying to name my Anti Camry blog. I commented under my "real" name (Kevin) and linked you to my more... ummm... mainstream blog. Keep up the good work. Your posts are interesting to read. The fact you get to drive all of those great cars (YEE HAAA and Livin' the Fantasy posts) seems like a real perk of your job, count me as jealous of the cool rides.